Three reflections regarding our assistive clothing project. 1. Design is trial and error, and mostly error. This was the first time when I worked on prototyping such a complex design challenge. Designing for adaptation is a constant balancing between what should be designed to “fit in” and what should be different and unique for the user. At first, we took a lot of variables into account. We tried to think of how these clothes need to be comfortable, easy to wear, should save time, not be stigmatizing etc. What we might have had in minds initially was to completely reinvent the sweater – to make a perfectly wearable, comfortable piece that one can put on I seconds and never get stuck again. But then we faced various constraints, especially during prototyping when we realized our invention is not saving anyone’s time. And we had to prioritize. We needed to quit trying to make the clothes measurably quicker to put on, instead we focused on making them feel easy to wear. And instead of reinventing the sweatshirt, we made small modifications that respond to the very specific needs of our users. 2. Be responsive to the users actual needs. Adaptive technology does not tolerate uselessness. If we decide to shorten time of putting on clothes by making a completely new sweatshirt design, it better work. We decided not to push too hard with our first idea, which was clearly not useful for the kids, and we took a step back. First thing to do: revisiting the user research, and especially the videos, to see exactly what are the difficulties kids encounter, and how much extra time they take. Thanks to that, we could figure who exactly could use our help, and what is their problem that we are trying to solve. 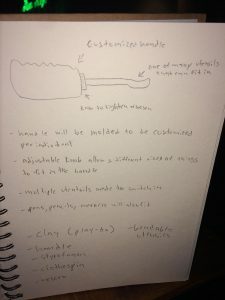 This one step back in the design process helped us be razor-focused on the exact design problems. 3. There is a great need for real accessibility here. There are two ways in which ableism plays a role in the lack of access to assistive technology. Firstly, it is still an under explored area, with a great potential for new inventions. That’s what the manager at Cerecare told us often, that there is a great potential especially here in China for what we are doing here. But the second thing is money. And it’s even harder to overcome. Whatever is named “assistive” seems to have its price tag tripled, just because it belongs in “medical equipment”. And here we get into the area of how public health and business are merging in really toxic ways. A lot of people came up to our stall at the IMA Show and were like: “Oh, that’s a great idea, but I wonder how expensive would that be?” So there is already an assumption that whatever serves or enhances the health or general well-being of an individual, or even remotely pertains to health assistance, must have an absurd price attached to it. Even the executives in the field see assistive tech as an opportunity not to increase public health, but to make bulk. I am happy for the fact that our project is open source from the very beginning, and it is designed to put as little economic strain on the families of children with cerebral palsy as possible. For the final project of the assistive technology class, we were given the challenge to create a prototype focusing on specific needs of the kids from Cerecares. Our group, Asiya, Maike and I were interested in the communication and classroom activities of the kids. 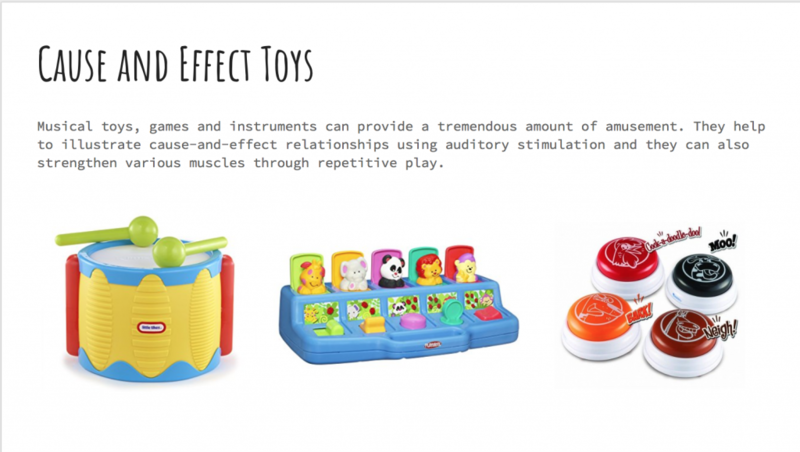 We first researched into different types of communication boards, toys and sensory equipments. 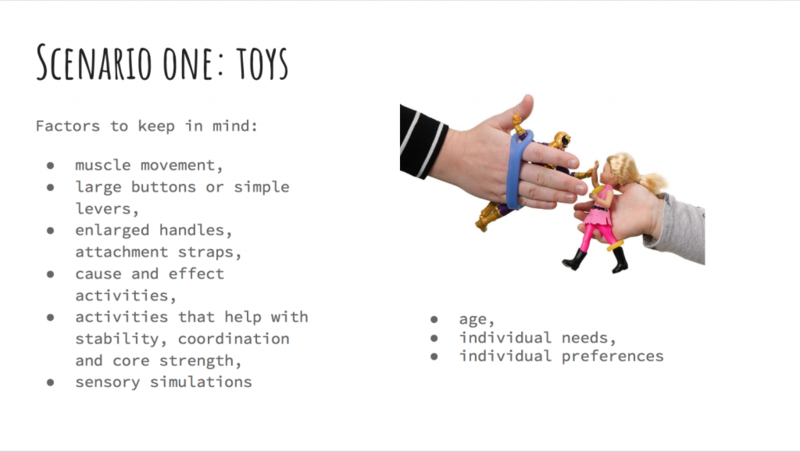 So we divided our inspirations and ideas into three categories of scenarios: toys, interactivity and communication and also environment. Here is a link to our first presentation slide. Shortly after that, we went to the center for our second visit and this time focuses on our target users Mango team. We learned that this group of five kids have relatively low mobility and intellectual ability. A lot of their symptoms are similar to the ones of autism, which fits very well with our research in the previous stage. However, as we observe their space more closely and have deeper conversations with their carers and faculty, we realize that they already have a great setup in terms of interactivity, communication and environment. 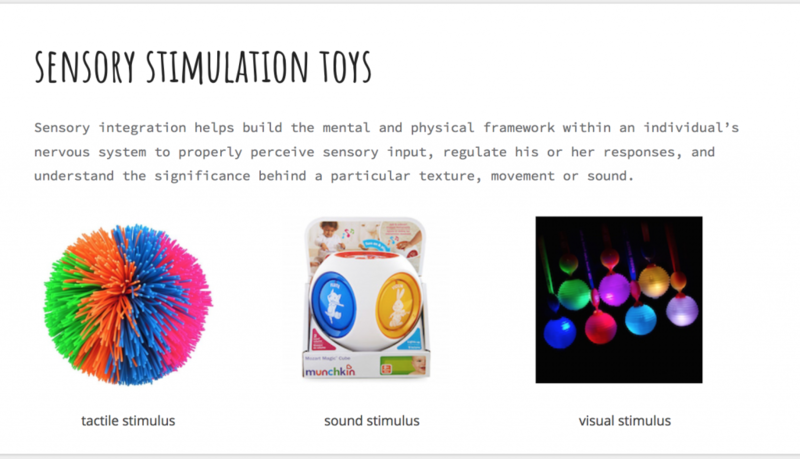 Their teachers specifically told us that the kids are highly intrigued with toys that have sound and light. 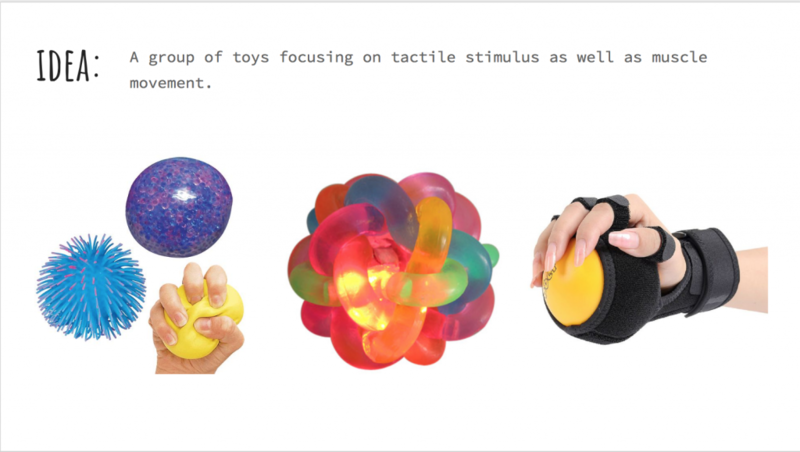 Since most of these interactive toys are made of plastic, they would appreciate some soft toys that also integrate these simple interactivity. 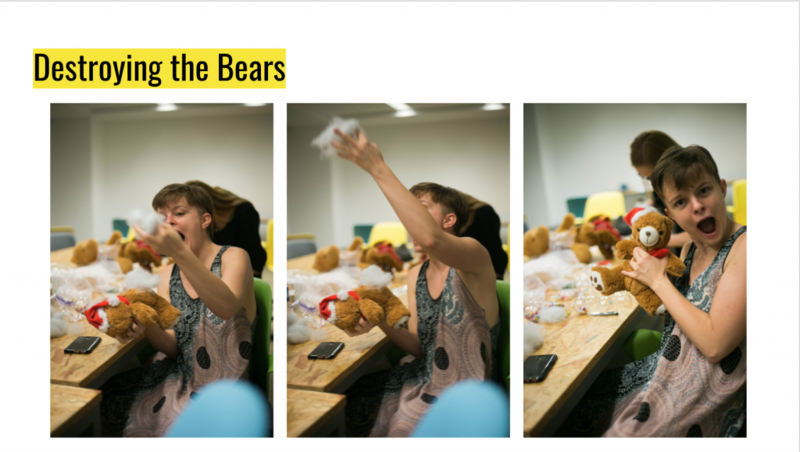 Therefore, we set our goal to be create simple hacks that add sound to common soft toys and also hack soft interactive toys and make them more accessible. Since we want the hacks to be simple and affordable, choosing the right materials becomes crucial since we want them to be easily found on the market. 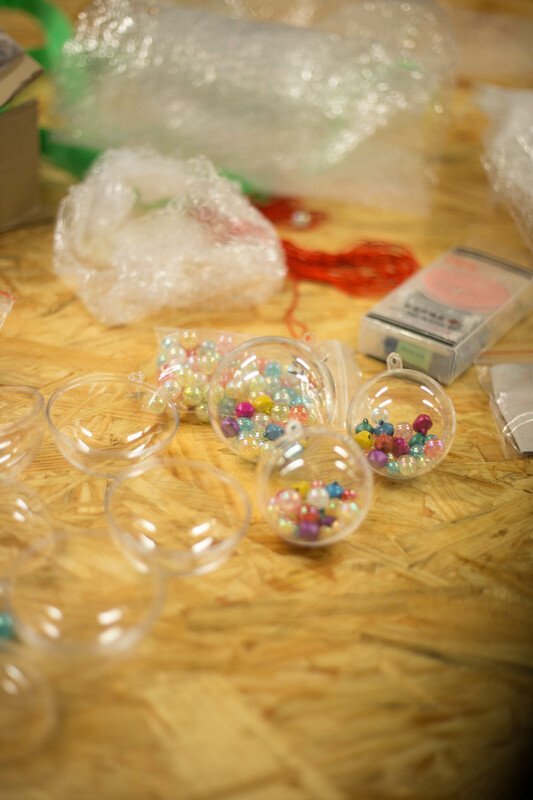 We went with beads, bells and plastic balls that can be easily purchased on Taobao and are always relatively cheap. We started to create these simple yet beautiful sound modules that make sound when being shaked. 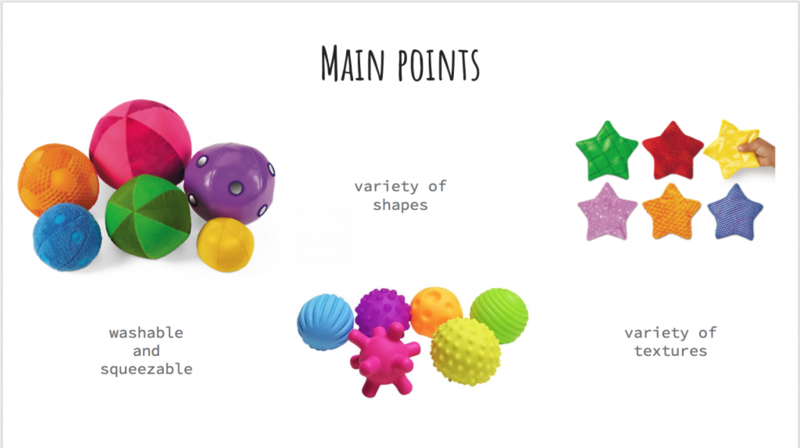 The plastic sound balls are very easy to make and can be put into almost all soft toys to add sound and different senses of touch. 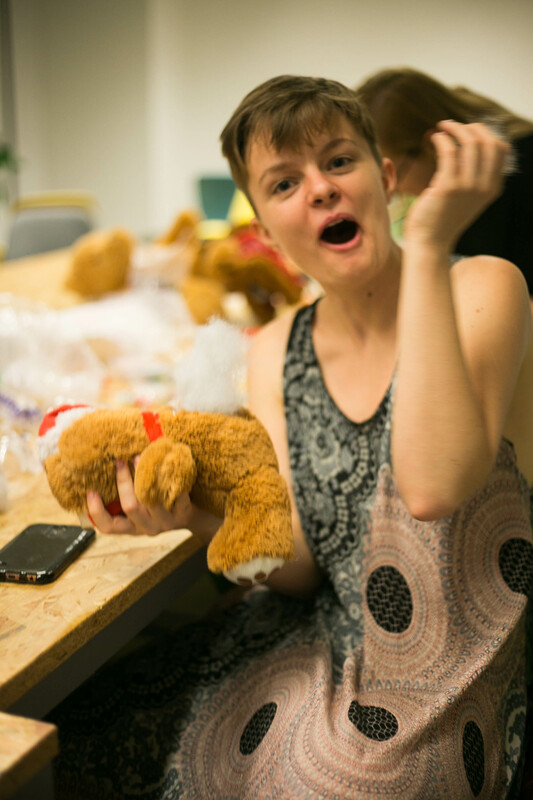 Then Maike and Asiya were in charge of breaking apart the soft toys that I brought from my own collection of old toys and putting the sound pieces in. 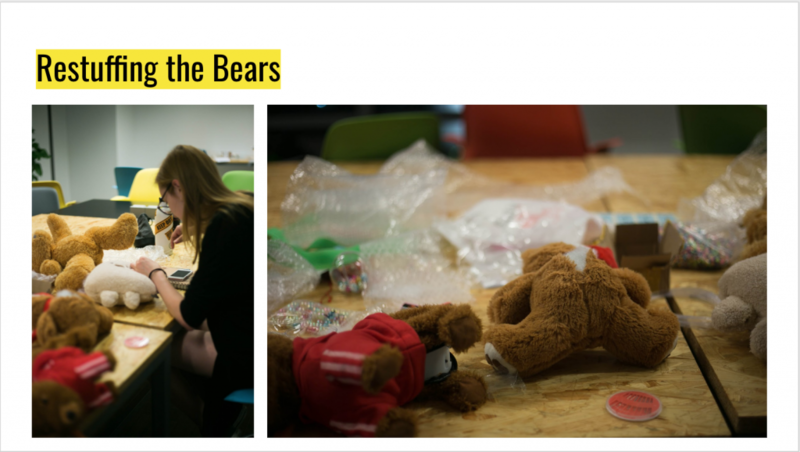 They also got creative in putting beads into the ears of these stuffed toys so that they can also offer different senses of touch for the kids. 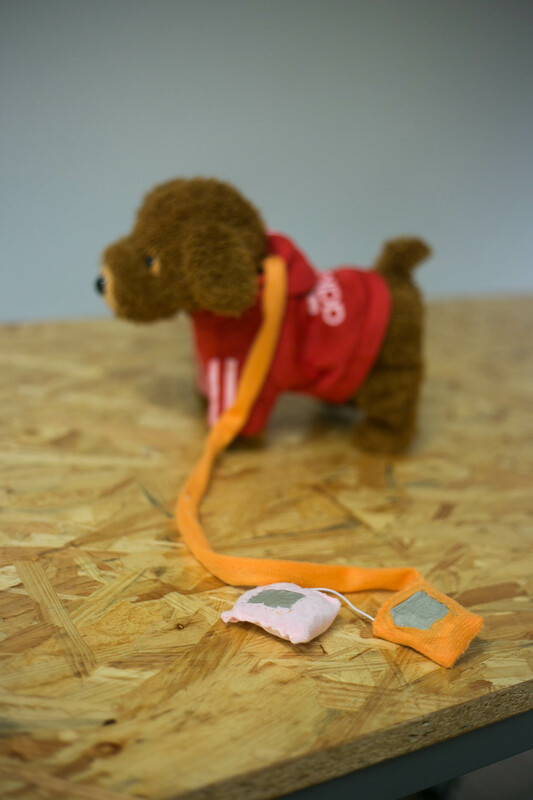 The one other toy that I bought from Taobao is a interactive teddy dog toy. I found it when looking for toys that are easily hackable reading the toy hack blog that Marianne recommended and came across this perfect soft toy with an attached soft button control. As in the description, the toy can walk and sing and has 38 songs in its storage, which is exactly what the kids would love. Seeing the potential of an easy hack with this toy, we purchased this and it turned out to be a great decision. This is how the button looked when I took if out of the soft pocket. I realized that this button is very difficult for Mango team kids to use since the button needs very precious movement of clicking at a very small area. So I decided to make a much bigger button and utilize the most of the soft pocket space. My solution was to use conductive fabric and have two separate soft pockets as the switch. Touching the two pockets would be on, otherwise the switch would be off. Having two pockets and the same kind of fabric in the middle has a clear indication that they belong to be put together as a switch. The one cable connecting the two pockets has rooms for improvement, but considering the time constrain of this project, we were happy with the simple prototype. 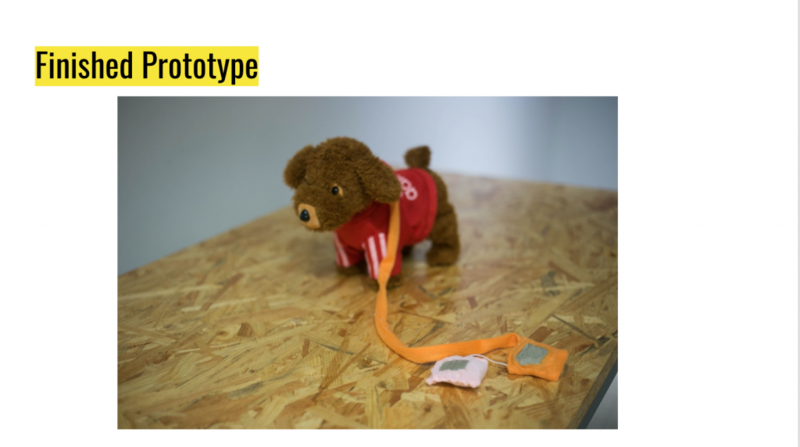 Here is a video of how the toy dog works. In general, I am super happy that I got to do this project with my amazing teammates and under the guidance and suggestions of Marianne as well as our classmates and the Cerecares team. As I said some point in the class, I always feel that the projects that I make in association with assistive technology are the ones that I find most meaningful and most fulfilling. This project is low-tech and not super time-demanding, but it is so far one of my favorite projects. Just seeing how much we can do with such simple hacks is amazing. I hope the kids at Cerecares will find these toys interesting to them. 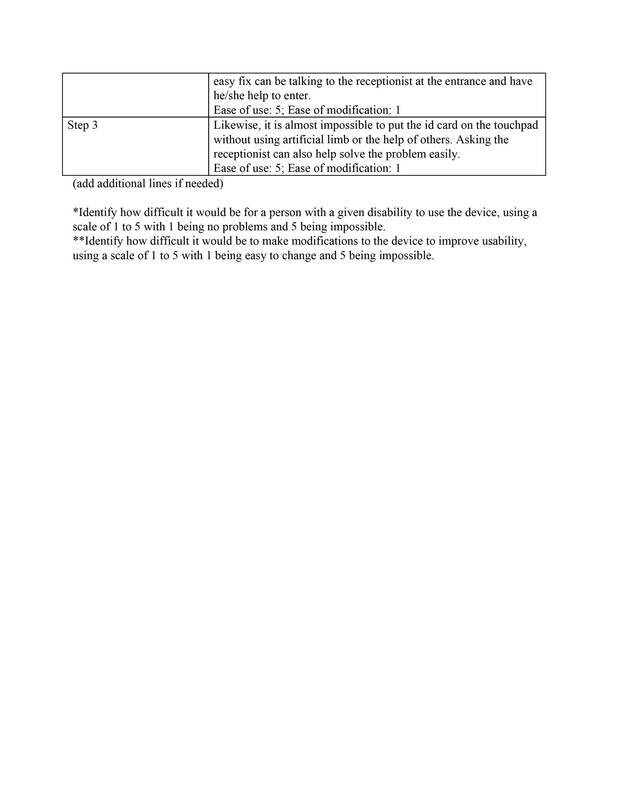 I definitely hope that this is only a starting point of me working with assistive technology. Thank you Marianne for introducing this amazing subject to me and our class. This article inspires me a lot in how we should challenge the idea of “user testing” in how the it should be testing not just the functionalities but also the emotional aspects of the experience. Especially when it comes to design that are related to assistive technology, it involves more than just clinical functionality but also “issues of self-confidence, security and just feeling comfortable with” the object and the design. And testing of these elements goes beyond the categories of hi-fi and low-fi, but a lot more about going into the details of the specific needs of the target group and how design of the testing experience can reflects its intention. Some irregular approaches such as having personal carers as the first group of testers instead of the patients and having prototypes placed in the testers’ living area for long term observation are both effective strategies that are designed for specific cases. 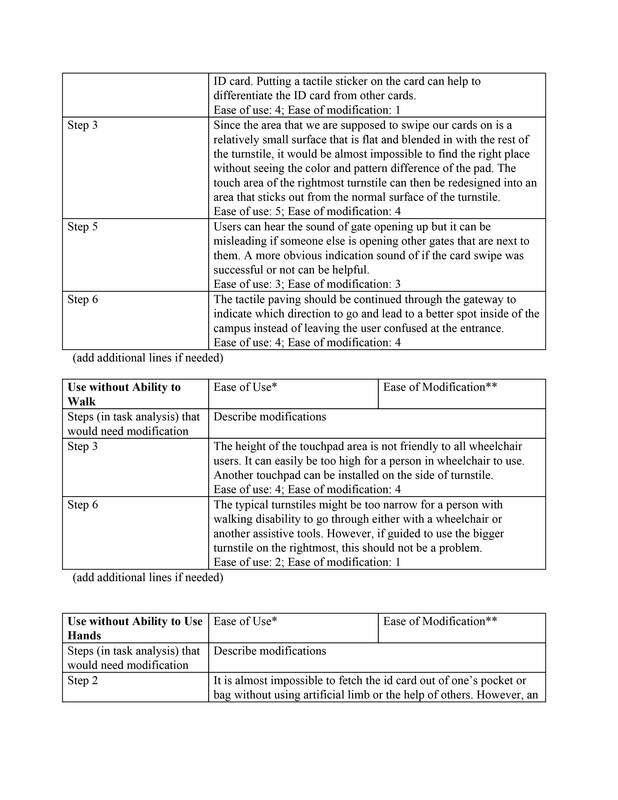 Now that I rethink about my previous approaches of user testing throughout the years at IMA, I realize how much I have often oversimplified this concept into a test of usability. I am really thankful for being introduced to this article and now being able to challenge my perception of user testings. First of all, I’d really love to express my thanks to all the guest speakers that we had in this class and professor Marianne Petit who led me to this awesome class and shared many helpful resources with us. I personally love this class really much because I’ve been thinking of designing an assistive product for disabled people since I once saw patients in rehabilitation center doing their best to get well. One of my family members suffered from cerebral hemorrhage two years ago and there were some sequelae. Having spent months in rehabilitation center, I knew many patients were eager to get completely well, or at least, could live their own lives without the help of others. 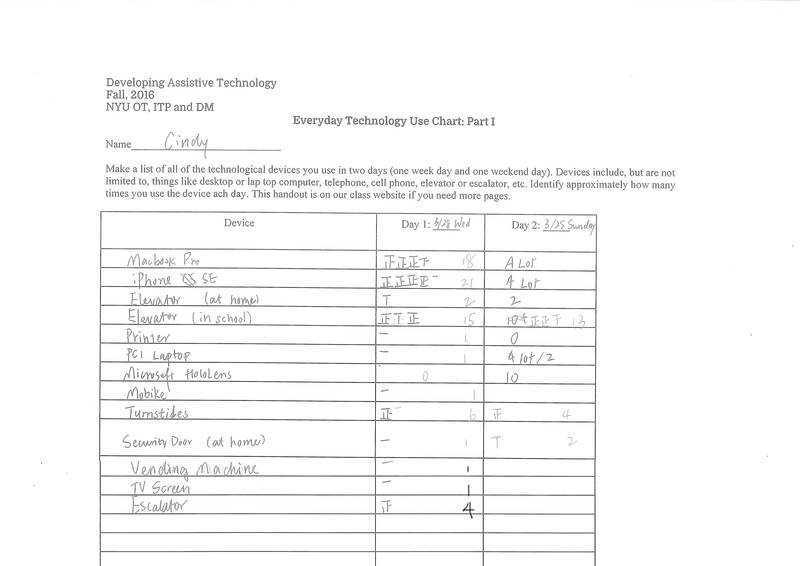 Therefore, that’s what I think assistive technology is supposed to help with. 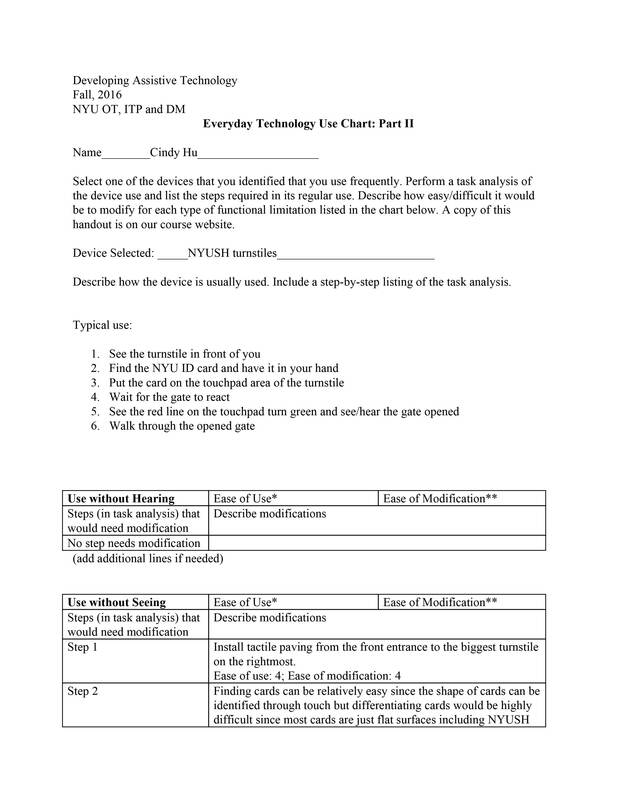 Throughout this 7-week course, from my understanding, what I learned about assistive tech is that it is designed and developed to assist people with disablities in communicaton, education, work, recration and daily living tasks, and in essence, help people with disabilities to be independent and enhance the quality of their life. 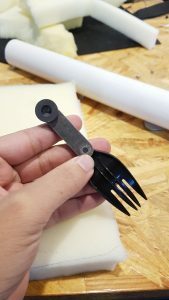 During visiting CereCare, we met some children having problems holding utensils or stationery steadily, and since Jeffrey has been into topics of food, we decided to design a product (prototype) for those children at CereCare who have the ability to hold things but could not hold it firmly to grab things easily. Project Description: Adaptive Utensil is an assistive device designed for kids at CereCare who are suffering from cerebral palsy to hold utensils easily and firmly. 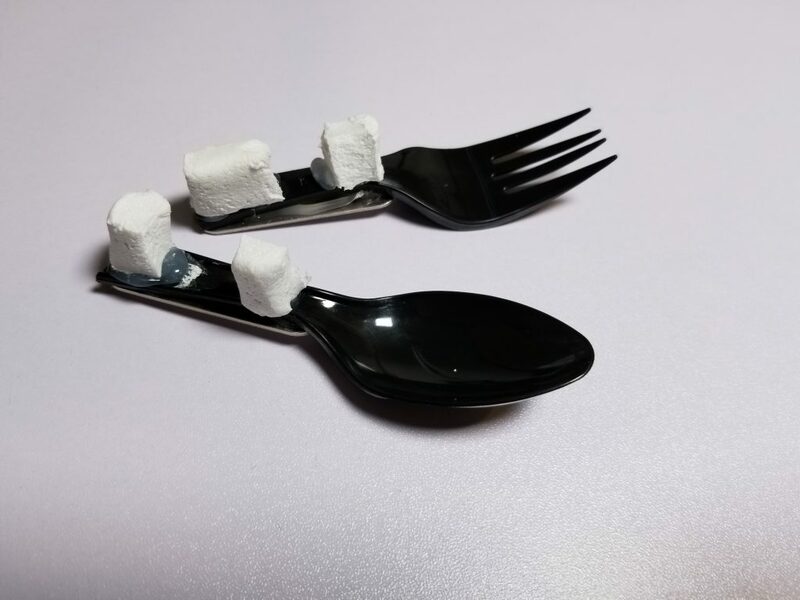 With a universal squeezable handle, there are various interchangeable heads which allow children to switch between different utensils like fork and spoon. I went back to CereCare to observe children’s behavior when eating and found some children were not our target users – children who are capable of eating by themselves; children who are not able to hold utensils and need to be fed by teachers. 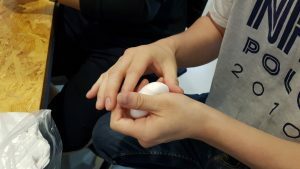 I definitely wanted to think about a way and another assistive technology for the latter group of children, however, at the current status, we could only focus on our target children. We divided the creation of our project into three broad steps: sketches,1st iteration of prototype, and 2nd iteration of prototype. In the beginning, we had a bunch of ideas and it was really hard to figure out where and how to begin. So Jeffrey recommended that we draw out different ideas to get things started. While drawing, we thought of like 5 different prototypes with different mechanisms that would allow the switching out of utensil heads. 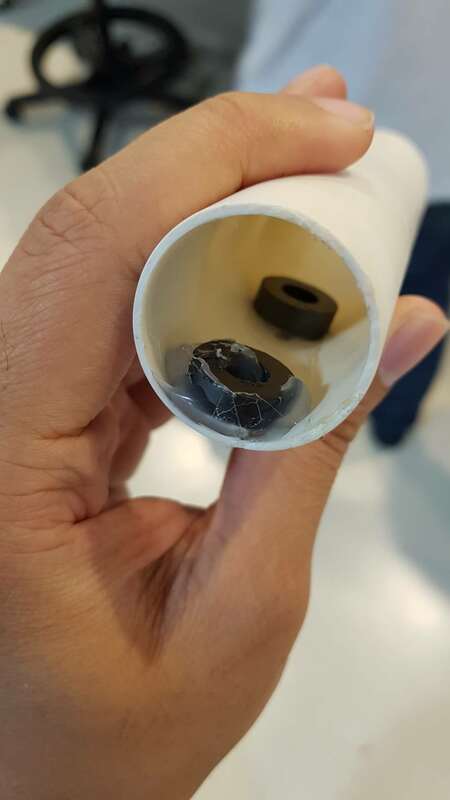 However, what we came to realize soon after was that many of the ideas we had in mind would be too advanced for a first or second iteration of prototype and that we should start with basic materials first. For the first version, we used a hard paper type roll for the base, followed by tape, a metal fork, foam, and a bottle cap. The prototype was very easy to put together, however, a lot of concerns arose once it was complete. Firstly, the fork was non-interchangeable. Secondly, the foam had no protective layer on top of it, making it completely unwashable. So for our next prototype, we went ahead to address those issues. The second iteration of our prototype was a little harder to put together, but it was more sturdy and complete as compared to the first version. 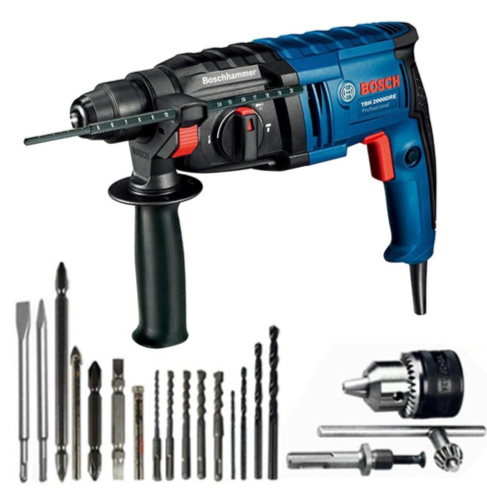 Here is the link to our slide which includes a demo video of demonstration. From the perspective of the projects, I think my collaborators and me are satisfied with what we have made because it could really help and solve problems instead of ones that just show off technology without concept and rationale behind. 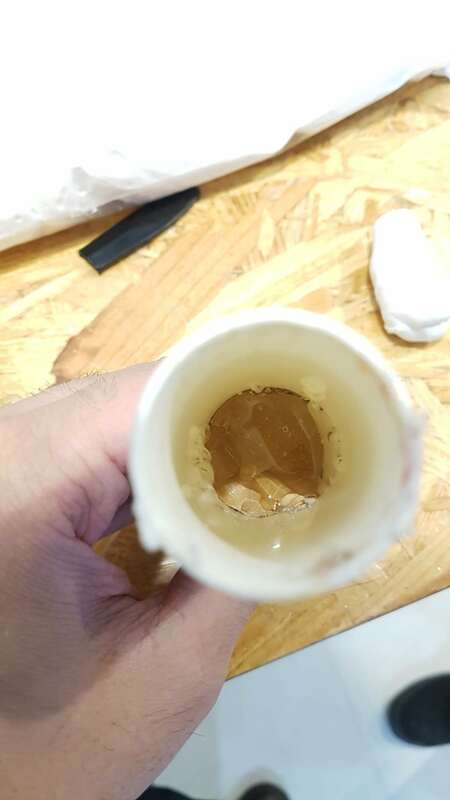 To be honest, I learned many things during the process of making this project, including but not limited to, hearing feedbacks and making improvements and various iterations, exploring many possibilities of different material and telling what is the difference and which could best serve our purpose. And in terms of collaboration, it was really good time discussing with my groupmates and seeing different possible outcomes and shifting our ideas based on situations. This week’s responses really made me think of the things that people with hearing disability can’t access. I am ashamed to admit that I never really realized that all those pretty content with good music would not be processed or understood by some people. Here is the thing, universities claim they are accessible to everyone but the reality is different. When creating content, universities, agencies and companies really have to THINK of everyone. Not just say it but really do consider everyone. Again, it goes back to the readings we had to do earlier this semester that there shouldn’t be a clear-cut false division between we and them. There aren’t “we and them”, there are us. So that makes me really upset that things like that happen. That people are not able to grasp any content except for an inspirational upbeat music. There’s gotta be this so-proclaimed inclusiveness implemented in everything we do. I honestly do not have anything more to say except that and I don’t want to add water to what I say. Things like that just have to happen. There shouldn’t be a question of price and time, it just HAS to be accessible for everyone. Again, the content production like Barbie, let’say, failed only because the price of production was too high for the company or university that makes billions. Well, really? That’s unacceptable. Or rather, inaccessible. Going back to our previous readings, beauty dictated beauty standards make some things popular without reflecting the reality. Once again, I am going to say that modern society claims to be inclusive but fails to prove it. This is the problem our generation has to work on to make real-life changes. To do that, however, we have to start with ourselves. As for our project, I figured it’s better to combine our preparations, progress and the final result in one post. Initially, we started off with researching possible ideas. My group decided to focus on recreational activities to provide for children of the center. We had three ideas at first, which we decided to filter out after the visit. In terms of presentation of ideas, I was responsible for the toys section. After our visit to the center, we discovered that the staff has already provided the children with all those possible toys but they really wanted to have soft toys with sound. So there, we embarked on a journey of coming up with ideas. 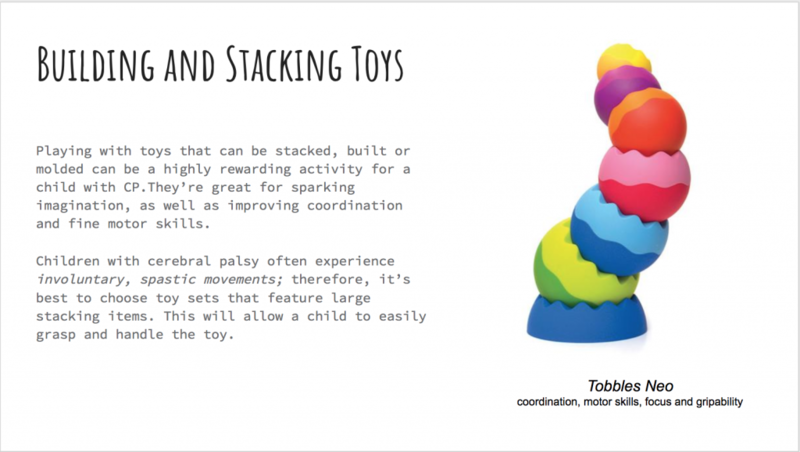 We decided to focus on toys modifications that would be easy and fast to implement for the staff. Therefore, we found that adding contained beads to the toys would be the most suitable solution. Together with that, we were also looking for the ways to make bigger button switches or simply modifying button switches in the way that would be understandable and doable AND cheap so that the center could use the toys that have already been donated without the help of a professional. The easiest solutions turned out to be adding the spheres of beads/bells into the toy as well as using conductive fabric to change the switches to a bigger size. So to make that happen, Cindy was so nice to offer her old toys to modify as well as order one cool ADIDOG from Taobao. I think the dog was one of our favorite things to play, even though we are rather old for that. It has 38 songs in the array AND it also records the environment any time it’s not playing music. 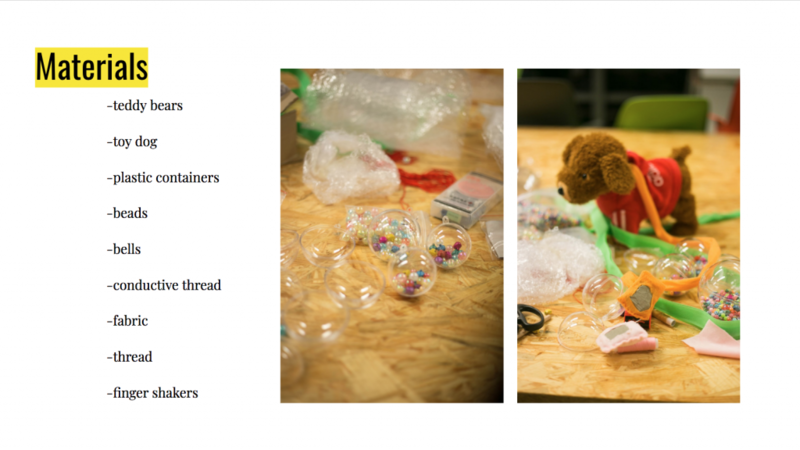 So, it was tons and tons of fun to rip apart the soft toys, construct the beads spheres and put them back together. 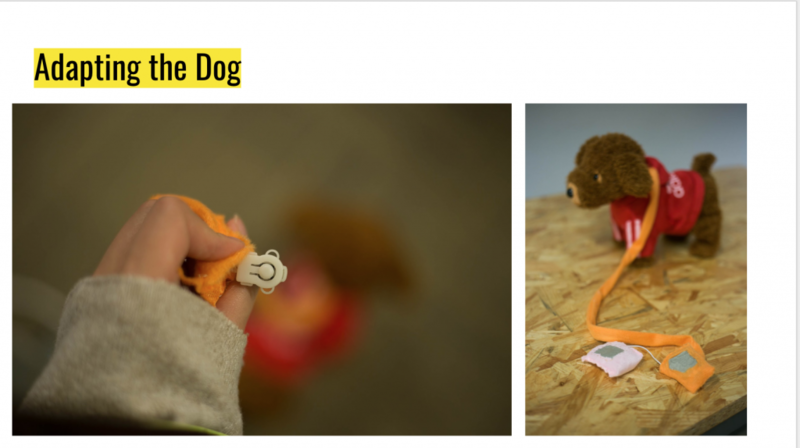 In addition to that, once we have seen the dog’s switch modified, we got so happy that kids can use it. Here are a few shots from our final presentation. Overall, this was one of the best projects I have ever worked on during my IMA career. I think we reached all our initial goals of making it as fun as possible, as easy to make as possible, as low-tech as possible and also we really made something the center wanted to have. So, I am glad I got a chance to work with the center! I guess the first thing to say is that I wasn’t able to come with the group to the center. Nonetheless, our final project group went there later during the semester, so I will write a few things about that. I wouldn’t say I was surprised when I saw the center located in a residential area. I am not sure why but I don’t have high expectations about Chinese attitude toward people with disabilities. From what I know, or how it seems to me, Chinese generally want to hide that fact. So, when I arrived to almost the end of Puxi, so far away from all the hospitals, facilities, convenience – I just wasn’t surprised. It felt like arriving to the middle of nowhere, to be honest. I wish it was different. I wish there were more opportunities for kids to have access to all the convenience of the city. However, after consideration, I realized that I am, in fact, a bit torn between thinking it was a good idea and bad idea at the same time. First of all, children are extremely sensitive. The city has lots of lights and sounds that could possibly cause an unpleasant reaction from sensory overstimulation. I might wrong about that. Also, it’s hard to have a fixed schedule in the city when children need it. The center really has to be a calm and relaxing place that stimulates just enough but not too much. So it’s hard to find that perfect solution. However, having the center located in such a distant location probably prevents people from going to volunteer there. I don’t want to be rude but I know how the prospect of spending hours on the metro first, then a bus, then another bus on the way there and back can be terrifying to people who live in Shanghai. It sounds silly but I am, for some reason, 70% positive that if only the center was in the center of the city, a lot more people would come and visit. Volunteer, in the first place. Once again, I might be horribly wrong. Aside from that, I think that the center is really trying their best in providing children with the best resources they can gather. Before we went there, our group had the initial plan of making some sort of sensory room or a playground. To our surprise, they already had one wonderful playground that had all the things we had researched previously. I wish I could be more critical about the staff as well but I really can’t. They seemed to be very caring, having a personal connection with every child and really wanting to make an impact on people who come in. They also never shied away from our questions and knew personal preference of every student. I am very glad the center has staff like this. One thing that I feel ambivalent about the fact that children are all sort of locked on the particular floors. I haven’t seen a single elevator but I have seen the staircases. So I would assume that the staff has to carry those who are unable to walk without assistance, which makes it extremely difficult. However, I see that the lack of elevators is not the center’s fault. After one of the guest lecturer’s speeches, we were introduced to the fact that there isn’t really enough funding for the centers like that. So, I wish that the center would have had a better funding and support of the community. At least, this is the impression that I got. For our Project, we wanted to create something that would help kids with bad grips eat. 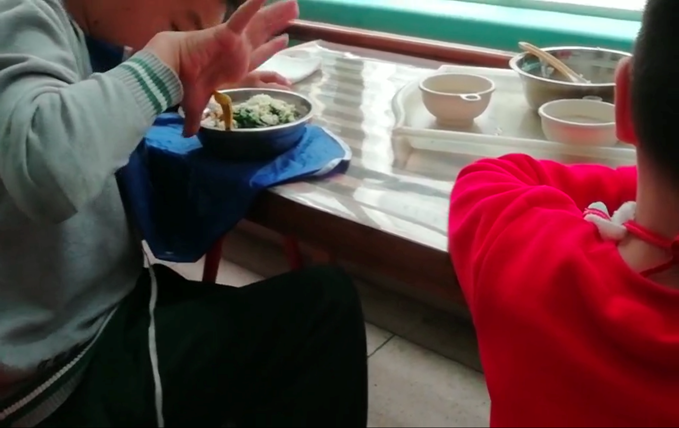 When we went to CeresCare, we realized that the children that could eat without assistance were having a very hard time holding the utensils; they could not get a good grip on it because the handle was too skinny. From this, we realized that the most important thing for these children was the handle of the utensils. 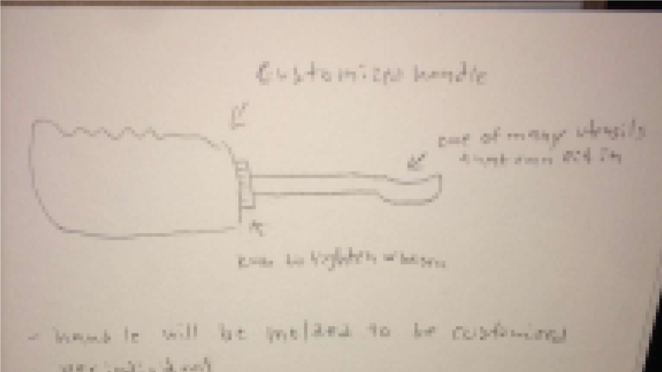 We then proceeded to brainstorm how we could create a handle that could be used by children with different grip ranges. We hypothesized and test many materials that would give a varying grip range and found foam to work the best. 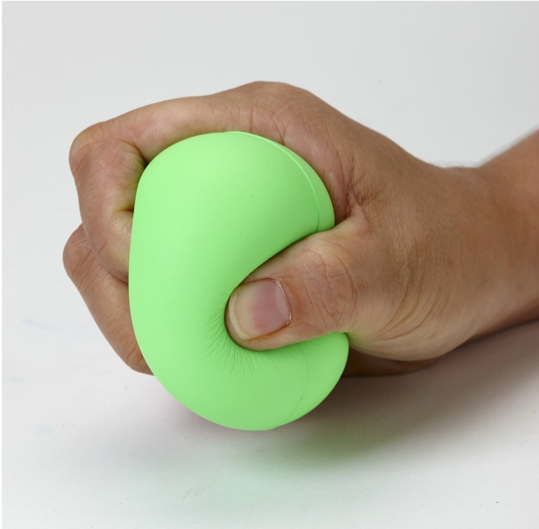 It was super soft and could easily be squished to adapt to different grips. 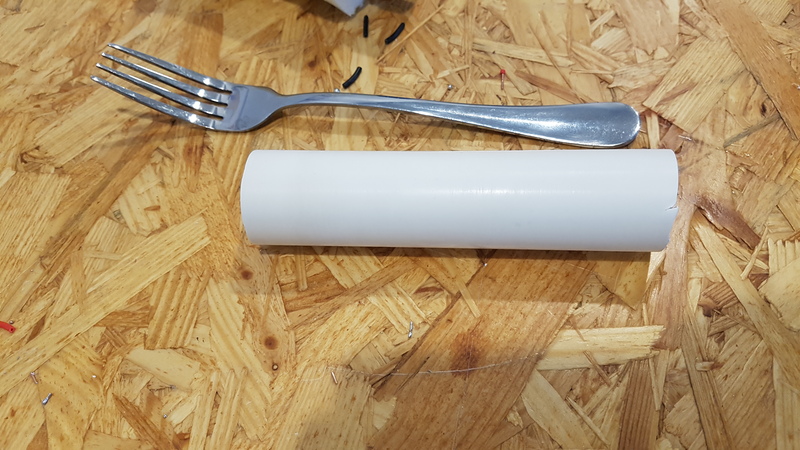 With our first prototype, we created a tube and wrapped it in foam. 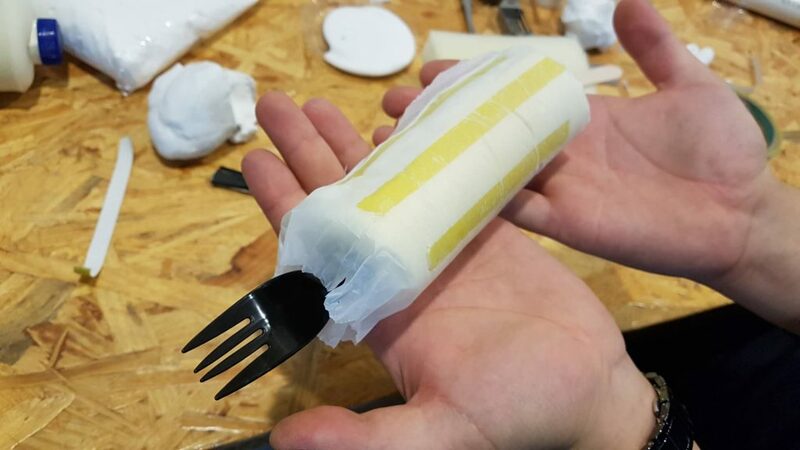 We then taped a fork in it. This was to test the handle itself. It seemed to be very effective. We also had a second prototype using clay but we decided that the foam was more comfortable and user-friendly. After our presentation of our first prototype, we learned that we needed to make our product washable and reusable. So we thought of ideas to do that. 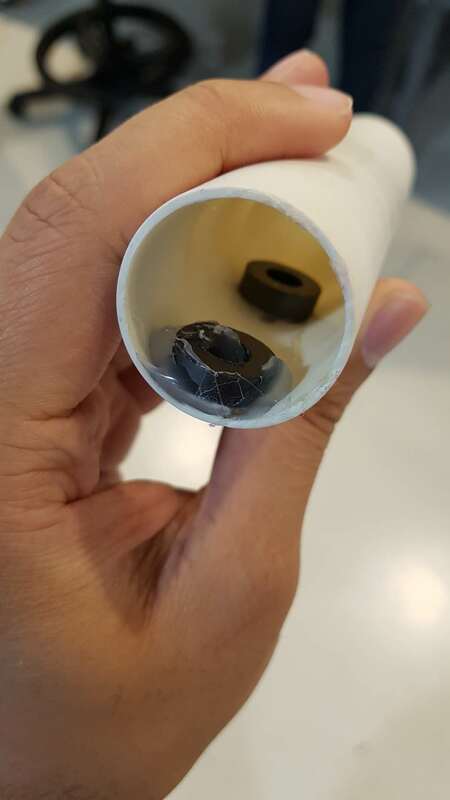 We started by cutting off a section of PVC pipe and sandpapering it down to make it smooth. At this point, we were really thinking about how we would easily change out the spoon and fork. We played with clay for a bit but found that magnets were the most successful result. 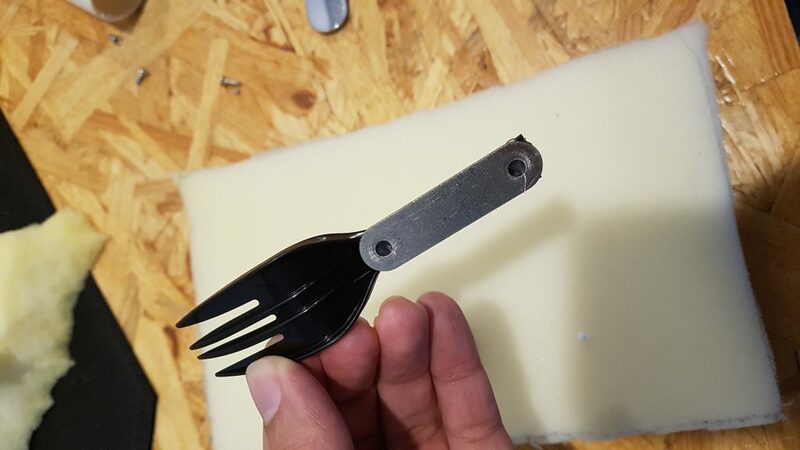 It was strong enough to hold the utensil without it falling but was still able to be replaced easily. We glued two magnets to the inside of the PVC pipe and then glued a metal strip to the plastic utensil. We found that the utensil was still moving a little when it was pushed down. 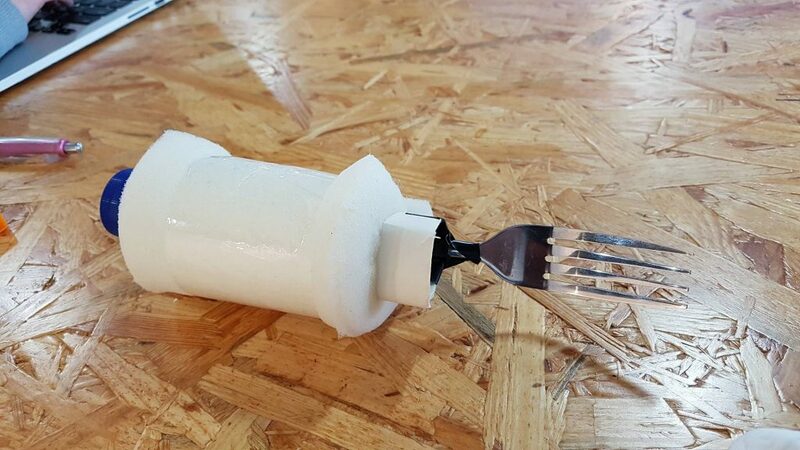 We solved this by adding cardboard in the middle of the PVC pipe preventing the utensil from going past it. It was really hard to glue the cardboard in there but when we finally managed to do so, it worked really well. 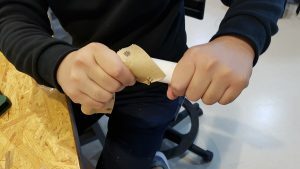 To stop the utensil from moving up and down, we glued clay to the top of the utensil to restrict from moving up and down. ndle washable. 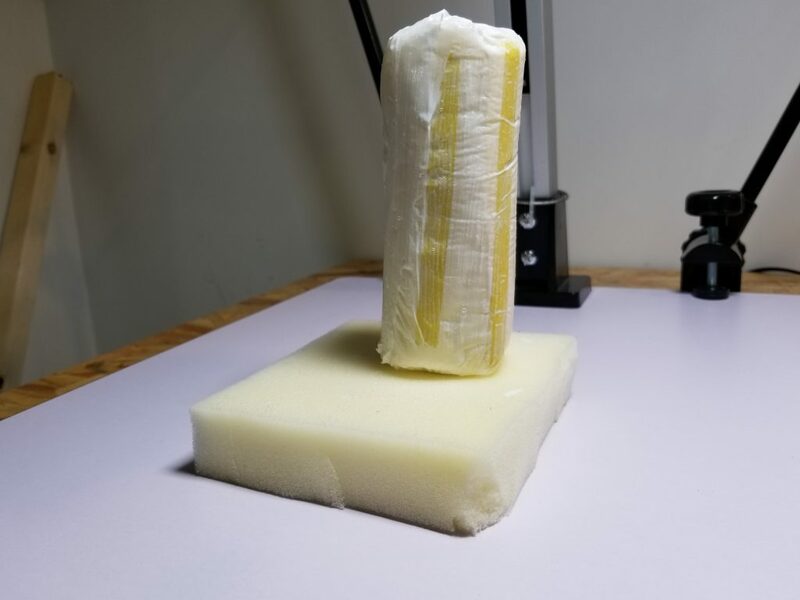 We wanted to wrap the foam with silicon but we were unable to order it from TaoBao. Instead, we cut apart a plastic bag and wrapped the foam in it. We then proceeded to use Modge Podge to seal the product making sure it was waterproof and washable. This worked really well. The handle was now waterproof yet still maintains the squishy property of the foam. Our final product was washable, adaptable, and useful. In the future, we would like to make it look more appealing and fill all the gaps in the handles. We would also like to find a more waterproof material.